Choosing to buy a home is an important step and one of the biggest financial decisions in your life. At PrimeLending, we are committed to providing you a mortgage process that is stress-free and simple so that you may enjoy the finer moments in life. Contact us today for a complimentary analysis and a mortgage without obstacles. S T R O N G .
The TVCC has come a long way since its inception in 1966. Since then the Temecula Valley has evolved into a beautiful, thriving destination. To help our community continue to prosper, takes hard work, from both people and organizations, working together. However, these partnerships don’t materialize out of thin air. Each TVCC partner has a common, clear vision and mission on how to build a diverse, strong community. And each partner knows the importance of collaboration and strengths of others will create the best outcome for our community. The TVCC would like to thank each of our community partners for their continued support of the Chamber and dedication to make Temecula an amazing place to live, work and play. Temecula Valley is the largest and most commercially successful winegrowing region in the South Coast AVA, the viticultural zone spanning more than 2 million acres from Riverside County to the San Diego border. The Temecula Valley Winegrowers Association has long served as a steward of the Southern California wine community. Comprising 35 wineries and more than 60 winegrowers, the Temecula Valley Winegrowers Association is a nonprofit regional organization dedicated to increasing awareness of the quality wines and wine grapes grown in the Temecula Valley and South Coast Appellations. Established in 1984, the Temecula AVA consists of 33,000 acres, of which approximately 1,300 acres are currently planted to commercial vineyards. Known as Southern California’s wine country, the Temecula Valley is located in Riverside County just one hour from San Diego, Orange County and Palm Springs and 90 minutes from Los Angeles. With natural gifts of climate and geography, bolstered by Pu’eska Mountain, the Rainbow Gap, and Santa Margarita Gap, Temecula Valley is widely recognized for its scenic vineyards, award-winning wines, and gracious and friendly wineries as Temecula Valley Southern California Wine Country. The popular boutique destination also includes Downtown Old Town Temecula, Pechanga Resort & Casino, and the Temecula Wine Country Golf Trail, and is home to three-time award-winning California State Winery of the Year, South Coast Winery. Visit Temecula Valley, the region’s official tourism marketing organization and resource for visitors is online including a complete daily Event Calendar at VisitTemeculaValley.com; “Temecula Valley Southern California Wine Country” on Facebook; and @Visit_Temecula on Twitter. Visit Temecula Valley also welcomes filmmakers, directors, writers, production companies, ad agencies, and location scouts online at FilmTemecula.com. The Temecula Valley Visitors Center is located in Downtown Old Town Temecula (Third Street and Mercedes) adjacent the free Old Town Temecula Parking Garage. For visitor information and assistance, call 888/363-2852 or 951/491-6085. The mission of the Economic Development Corporation of Southwest California is to enhance business retention and development by promoting economic growth and a positive business environment that enables the sustained economic success of the region. Southwest California companies rely on the EDC to take a leadership role in economic development, with the primary focus on creating a rich, sustainable economy that provides high-wage jobs. The EDC establishes the critical link between local government and the business community. In today’s competitive environment, with or without the EDC, local economic development strategies will be developed and implemented. Absent a private-sector economic development organization like the EDC, it is virtually assured that local government will be required to assume the responsibility for those economic development strategies. The primary advantage of a public-private model is that the private sector involvement is greatly expanded, thus gaining the expertise, knowledge, energy, resources, and the “buy in” of the business community. The role of the EDC is to ensure that the private and public partners together are given a substantive position in determining our region’s economic future. S C O R E SCORE is a nonprofit association dedicated to helping small businesses get off the ground, grow and achieve their goals through education and mentorship. We have been doing this for nearly fifty years. Because our work is supported by the U.S. Small Business Administration (SBA), and thanks to our network of 11,000+ volunteers, we are able to deliver our services at no charge or at very low cost. We can provide: Volunteer mentors who have their expertise across 62 industries Free, confidential business counseling in person or via email Free business tolls, templates and tips online Inexpensive or free workshops and webinars Our 320+ chapters hold events and workshops locally across the U.S. and its territories, and match up entrepreneurs with local, volunteer mentors. In 2013, SCORE’s volunteers donated 1.1+ million hours of their time to help start up 38,630 businesses; create 67,319 jobs, 40,175 clients increased revenue; and mentor and train 124,817 small business owners and entrepreneurs. The Old Town Temecula Association, (OTTA), was founded in November of 2009. This new association of merchants was born of two different groups of people who merged together after finding their interests and goals were all centered around the betterment of the district of Old Town. The name was chosen so as to always leave the door open for our local Old Town residents and building owners to join in the promotion and activities of the area. Our logo is a simple wagon wheel, signifying the roots of the community dating back to the early stagecoach days with a simple offering of “Old Town Experience”. The OTTA works to offer visitors and local residents the opportunity to have the best experience possible when stepping into the district. Our mission statement is, “The OTTA works cooperatively to promote, protect and enhance the vitality of Old Town Temecula”. We do this by providing a walking map of the district that shows users where they can Dine, Wine, Play, Stay and Explore. All retail businesses are listed on the map including retail shops, winery tasting rooms, restaurants as well as the location of the 16 historic plaques that adorn various locales within the arches. Additionally, we provide an informational website for the more tech-savvy visitor. We utilize our relationships with promoters, event organizers, local community partners and our City of Temecula Staff to keep a flow of information to all interested parties as to the activities and local events going on in the district. Anyone is eligible to receive our information via email. Community partners and members are invited to our quarterly mixers to help become more educated on what is happening in Old Town. In short, there is a lot to experience and the OTTA is here to help. The Inland Empire Small Business Development Center (IESBDC), hosted at Cal State San Bernardino’s Inland Empire Center for Entrepreneurship, provides the small businesses and entrepreneurs in Riverside and San Bernardino Counties with business assistance services from a variety of locations in the Inland Empire. It has been helping small businesses climb the ladder of success for over 20 years. The SBDC’s mission is “to provide the Inland Empire small business community we serve with affordable access to quality consulting, powerful training and key resources that allow people to achieve their dreams.” SBDC Business Consultants work with their clients in a confidential, one-on-one relationship. Consultants offer their guidance and expertise to help clients build a better business. Taught by SBDC Business Consultants and experts in various fields, the SBDC’s low cost, informative seminars and workshops are designed to give small business owners immediate knowledge they can put into action in running their businesses. Each business has its own particular needs. The SBDC recognizes that by offering specialized services and programs. Consulting and seminars cover topics from starting a business, funding a business, expanding a business to the buying or selling of a business. Additional Seminar topics include Legal, Human Resources, Taxes, Government Contracting and International Trade. The Inland Empire Small Business Development Center is funded in part by the U.S. Small Business Administration and receives partial funding from contracts with sponsorships from Cities, Chambers of Commerce, Counties, State, and Corporate entities. Working in the southwest region of the Inland Empire since 2005, Paul Nolta, Assistant Director, has developed long term working relationships with Temecula Valley Chamber of Commerce and together we have had a number of small business successes in the region. The Southwest California Legislative Council - Nine Years of Local Business Advocacy Are you familiar with what your Southwest California Legislative Council does on behalf of Valley businesses? The Southwest California Legislative Council is a coalition of the Temecula Valley, Murrieta, Lake Elsinore Valley, Menifee Valley and Wildomar Chambers of Commerce. The mission of the SWCLC is to provide a basis for the five chambers to act on local, state and federal issues to secure a favorable and profitable business climate for the region. That means as a member of the Temecula Valley Chamber of Commerce, you are partnered with over 2,800 other business members representing nearly 30,000 employees across the region to advocate on behalf of local business interests. The Chamber feels it is critical to have the business voice of Southwest California, YOUR voice, heard in Sacramento and the council has been filling that role for the past nine years. During that time the Council has established a reputation as a bi-partisan voice for business, supporting job-friendly legislation and opposing job killers regardless of party of origin. Council meetings are routinely attended by representatives of our cities, county, state and federal government where we can engage in conversation to advance the goals of the local business community. We also notify legislators by fax and email on the dozens of bills we adopt positions on and track those bills through to their passage or failure. Based on those positions, the Council also publishes an annual Legislative Report Card, which you may have seen printed here, keeping our Legislators accountable to their vote record. We are proud to say that our local Legislators routinely score at, or near, 100% in their support or opposition of the bills the SWCLC takes positions on - bills that will ultimately help our state return to a more business friendly environment. Legislative Council meetings are held the 3rd Monday of each month at noon at the Realtor Home at 26529 Jefferson Avenue. Meetings often feature lively discussion and debate on the issues before us, including spirited input from our Legislators or their representatives. If you have any information about bills that would be beneficial or harmful to your business or industry segment, we encourage you to join us at our meetings. You can also forward information regarding the bill to gad@swcaladvocacy.com for consideration by the Council. Temecula Valley Entrepreneur’s Exchange (TVE2)is a City of Temecula sponsored business incubator for startup technology companies. It offers affordable, collaborative office space, conducive to sharing ideas and networking with other entrepreneurs. TVE2 startup companies gain access to basic business services and mentors. TVE2 also functions as a regional business resource center to further support our local businesses and entrepreneurs by providing businessrelated workshops, special events and no-cost one-on-one business consultations through our partnerships with the Temecula Valley Chamber of Commerce, IE SBDC, EDC, Tri-Tech SBDC, MSJC, and CSUSM @ Temecula. In the Fall of 2014, TVE2 will be home to the Temecula Education Complex 2 (TEC2) where MSJC and CSUSM @ Temecula will provide students with a seamless transition from the associate’s degree to the bachelor’s degree with all coursework conducted on site, locked pricing, guaranteed time-to-completion and a collaborative cohort-based model. To learn more about TVE2 visit www.tve2.org or call 951-506-5180. Temecula has strived to create a future enriched with maintaining the highest levels of public safety, expanded job growth, a wide variety of retail, food and entertainment opportunities, higher educational opportunities and keeping well maintained roads, landscaped medians, and beautiful parks. Community Special Events have become long time traditions that help to define who we are as a City and are important contributors to the high quality of life that our residents have come to know and love. As this year marks our 25th Anniversary as a City, we are thankful for the invaluable relationships created with our business community, local non-profits, and thousands of residents and volunteers who give their heart and soul to Temecula, its people, and its causes. Without you, Temecula would not be who we are today. “Our success has really been based on partnerships from the very beginning”. – Bill Gates We are very grateful for the outstanding leadership and close partnership with the prestigious Temecula Valley Chamber of Commerce Board, Staff and Members. You are the eyes and ears of our business community and an integral part of the Temecula Valley economy and with that, we sincerely thank you! For more information on the City of Temecula, please contact Christine Damko, Economic Development Analyst at christine.damko@cityoftemecula. org or 951-693-3952. The 8th Annual Women In Business event will take place at the beautiful South Coast Winery Resort & Spa. Join the TVCC for an event that focuses on providing an opportunity for women to network with each other, find resources, mentor others and receive additional education and support. This year’s event offers you the opportunity to hear three incredible business women speakers including our keynote speaker, Darcie Harris. As CEO and founder of EWF International, a company offering peer advisory groups, coaching and consulting for professional women, Darcie has helped hundreds of women realize their professional dreams. Through the Alpha Mare Academy™, she offers her knowledge and tools to female entrepreneurs worldwide through the web. We look forward to seeing your business represented at this great event. Many sponsorships are available. Be on the lookout for more information. If you are interested in participating as a sponsor, exhibitor or event guest please contact Jennifer Cloud at jennifer@temecula.org or (951) 676-5090. E X T R A V A G A N Z A ! You are not going to want to miss this year’s Monte Carlo Extravaganza! This year’s event will take place Wednesday, September 17, 2014 at Wilson Creek Winery from 5:30 to 8:30pm. Feed your senses with the sights, sounds, and tastes from our local restaurants. Try your hand at Poker, Black Jack or Texas Hold ‘Em. Attendees will also have the chance to win a Grand Prize of $1,000 or $500 that will be given away at the end of the event! Tickets are $30 pre sale which includes $200 in play money. Tickets will be sold at the door for $35 but includes only $100 in play money, so get your tickets early! This event offers you a great opportunity to market your business to over 300 attendees. We have many levels of sponsorships available. Sponsorship provides exposure of your company to many local businesses. If you are interested in making sure your business is recognized at this event, contact the Chamber to find out how at 951-676-5090 or jennifer@temecula.org. W I N N E R S ! Longest Drive Winner: Russ T. Young, Riverside Community Hospital Putting Contest Winner: John Muesse, The Press-Enterprise Rubber Ducky Race Winner: Scott Word, Pacific Western Bank And thank you again to our Title Sponsor, The Law Offices of Rosenstein & Hitzeman, AAPLC. Receive information from those closest to the action. Learn about the budget and the likely impact on you. Get insights on current issues affecting our state. Become a better advocate with tips and information you can use to make your voice heard. B E G I N Y O U R D AY W I T H R E F F E R A L S , L E A D S A N D O P P O R T U N I T I E S The TVCC Morning Mixer is a networking event held the 4th Wednesday of each month. It is attended by over 60 Chamber members and business professionals. This year the event will be held at BJ’s Restaurant in Temecula located at 26500 Ynez Road. TVCC members are free to attend and future members are $20. There are available openings for Spotlight Speaker Sponsors and Expo Table Sponsors. For more information, please contact the Temecula Chamber at (951) 676-5090. Back by popular demand, the Temecula Valley Chamber of Commerce is hosting the incredible trip, Mission to China! The Chamber will once again partner with Citslinc International Inc., who works with over 800 chambers in the US and Canada to send over 20,000 people annually to visit China. During this tour you will visit memorable sites, both ancient and modern, and enjoy a multitude of unforgettable experiences. Trip highlights are Beijing, TianAn Men Square, The Great Wall, Lingering Gardens, Suzhou, National Embroidery Institute, Hangzhou and Shanghai. The Mission to China trip will have you departing on October 20, 2015 and returning on October 28, 2015. The cost of this 9-day trip is $2,399 per person based on double occupancy. There is an optional tour for additional $500 to Xi’an to see the Terra Cotta Warriors. Trip amenities include three meals a day, roundtrip international airfare, 5-star or 4-star hotel accommodations, transportation to & from the LAX airport, deluxe tour bus, English speaking tour guides and admission tickets to tourist attractions. Register today for this amazing trip! A $250 deposit is due at time of registration. The trip deadline and full balance is due by August 1, 2015. Hurry and make your reservation! Space is limited! Join us for a special China Travel Orientation.This informative presentation will be held on Tuesday, July 15, 2014 from 6pm-7pm at the Temecula City Civic Center Conference Room, 41000 Main Street, Temecula CA 92590. To RSVP to attend, please call Brooke Nunn at (951) 676-5090 or email brooke@temecula.org. D E A L ! e v e n t .
B U S I N E S S ! ribbon and the giant scissors. If you have a home office or no physical business location we can do it right at the Chamber. Contact Katie in the Membership Department at katie@temecula.org to learn more or to schedule your ribbon cutting. DR. JEREMY GREEN, D.C. WITH GREEN CHIROPRACT I C Dr. Jeremy Green, D.C., is a local chiropractor who has been practicing in Temecula Valley for the past three years. He owns and operates his own clinic, Green Chiropractic, where he specializes in treating auto accident injuries and sports injuries. Dr. Green graduated with his B.S. from Brigham Young University, then went on to receive his D.C. and M.S. degrees from Logan College of Chiropractic in St. Louis. VYP’S CIVIC COMMUNITY INVOLVEMENT The Valley Young Professional’s civic committee focuses on 1 local nonprofit member each month, with efforts in providing volunteers for their events, fundraising and promotion. VYP just wrapped up their annual Oak Grove Room Decoration Project that was awarded to 2 young ladies at Oak Grove Center for Education Treatment and the Arts. VYP meets with the kids, gets their design ideas, raises funds and then goes out and purchases all the materials and redecorates. This was VYP’s 5th year organizing the project and it was a great success. VYP raised over $1000 and recruited over 17 volunteers, thanks to our local businesses. Thank you for your continued support in our efforts to give back to our community. Members of the Valley Young Professionals can get involved with the different committees from civic to events. VYP has organized groups that create and coordinate the many events and benefits that VYP has to offer. Please visit the VYP website for more information or for the calendar of events. www.TemeculaVYP.org. 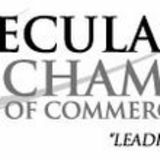 THE TEMECULA VALLEY CHAMBER OF COMMERCE Being a member of the Temecula Valley Chamber of Commerce (TVCC) offers numerous benefits and keeps business owners on top of important, ever-changing issues and trends within the City. Membership with the TVCC gives your business credibility, making consumers more likely to do business with you. 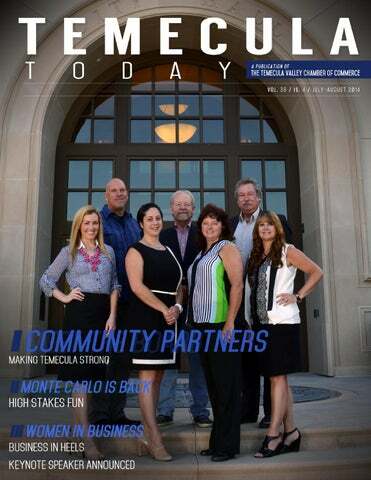 Founded in 1966, the TVCC has long been a crucial element to Temecula’s business initiatives. The Chamber fosters a greater sense of business community, identifies emerging leaders, and advocates on behalf of small businesses. To learn more about being a member of the TVCC, call Katie Cook, Membership Director, today! But some longtime political observers have noted that Roberts changed his mind in the past when faced with an approaching filing deadline. The filing period for the council race opens July 14. It will close Aug. 8 unless one or more incumbents do not seek re-election. If that occurs, the campaign filing period will be extended until Aug. 13. At least one prospective challenger attended Edwards’ State of the City presentation and spoke with her briefly afterward. The challenger – Matt Rahn – acknowledged that considerable politicking took place on the periphery of the event. “A lot of it,” said Rahn, who announced his candidacy in February. Rahn rose to local prominence during the successful grassroots effort that thwarted Granite Construction Co.’s plan to open a granite mine in the hills south of Temecula. Rahn – a university educator, researcher and land use consultant – said he is assuming that Comerchero will seek re-election. Rahn said he is uncertain about Roberts’ status, but the possibility of a third incumbent in the race did not color his decision months ago. Rahn said he is planning a fund-raising gathering soon, and many business leaders and environmental activists are supporting his candidacy. “I’m looking forward to it,” he said of the approaching campaign. CROSSOVER In legislative terminology, crossover is that time of year when a bill that has been introduced in the California Assembly or Senate, must pass from its house of origin to the other house or it is considered ‘dead’. It’s a particularly frantic time in the Capitol as literally hundreds of bills that have languished for months must be voted on or the hoped-for legacy of their author is denied. This year is even more critical as it is the 2nd year of our two year legislative session in Sacramento so some bills that have been around for over a year must be passed or die. It’s an ugly time to watch live proceedings from the floor of the Legislature as sometimes inches-thick bills are unceremoniously dumped on a Legislators desk and their vote on that measure is demanded moments later. Some of these bills may be familiar from previous votes, some may be brand new from committee and some will have been subject to the old gutand-amend process whereby a previously innocuous bill has been replaced by a doppelganger with evil and costly intent. This will happen hundreds of times during the final week of May and, if you keep a running tally of the moneys proposed to be spent in these bills, you will exceed the state budgetary limits within hours and approach the national debt ceiling by week’s end. It’s incredible. To date, the SWCLC has adopted positions on some 55 bills or measures, supporting 28 and opposing 27. Considering the political mix in Sacramento, finding 28 business-friendly bills to support has been no small effort and we are hopeful that some of these bills will actually pass all the way through and be signed into law by the Governor. We are hopeful but not optimistic. Historically we will have greater success killing some of the bad bills than we will getting the good bills passed - but that’s OK too. If we can’t make anything good happen, at least preventing something bad from happening will prevent additional economic and regulatory burdens from impacting our local businesses. For example, a bill by Melissa Melendez (R-Lake Elsinore) that would have eliminated franchise tax bills on qualifying new employers for five years, a bill we heartily supported, was defeated in committee. Another bill by Brian Jones (R-Santee) that limited frivolous lawsuits against small businesses alleged to have been in violation of Prop 65 was also defeated. A bill by Bob Huff (R-Diamond Bar) that would have allowed businesses to expand and modernize within their existing footprint without jumping through CEQA hoops was amended into oblivion and now languishes in committee. It’s hard to get a good business bill passed. Unfortunately a bill that would authorize a split corporate tax roll to circumvent Prop 13 protections is proceeding, as are bills that would require employers to pay sick days after just three days of employment, a bill that purports to increase public safety by requiring costly and intrusive food labeling in the state, bills that further restrict hydraulic fracturing and exploration of local oil reserves and a bill that would significantly expand last year’s bill to increase minimum wage. It’s hard to get a bad bill killed. If there’s any good news coming out of Sacramento, it’s that some of the more onerous fiscal bills may die in the Senate this year because indictments and suspensions have cost the Democrats their supermajority vote. While this won’t impact the passage of many bills, any bills seeking to increase or modify your taxes may not make it through. For the latest in what’s happening in Sacramento that can affect your business, join us every 3rd Monday at the Realtor House, 26529 Jefferson Ave, Murrieta. The SWCLC is a Chamber member benefit and we invite you to get to know us. T he Groves, in Temecula Wine Country, is an exclusive gated community of up to 37 new luxury residences. Homes are nestled into a natural & inspiring landscape surrounded by established groves. Ideally perched above the Valley, this elite community offers magnificent views & a rare opportune location. Inspiring floor plans are ready for viewing. Keep informed. Register at TheGrovesWineCountry.com. 41828 Knoll Vista Ln.,Temecula, CA 92592 Left on Anza, right on De Portola, left on Pauba Rd. Open Daily 10:00 - 5:00 • Closed Wed. & Thur. GOV. BROWN SIGNS 2014-15 STATE BUDGET Governor Edmund G. Brown Jr. signed a balanced, on-time state budget that pays down debt, shores up the teachers’ retirement system, builds a solid Rainy Day Fund and directs additional funding for local schools and health care. “This on-time budget provides for today and saves for the future,” said Governor Brown. “We’re paying off the state’s credit card, saving for the next rainy day and fixing the broken teachers’ retirement system.” The budget includes a plan of shared responsibility among the state, school districts and teachers to shore up the State Teachers’ Retirement System (STRS). The first year’s contributions from all three entities total approximately $276 million, growing in subsequent years to more than $5 billion annually. This is projected to eliminate the unfunded liability in the system by 2046. The budget also directs $1.6 billion into the state Rainy Day Fund – the first deposit into the fund since 2007. The fund is expected to grow to $4.6 billion by 2017-18, if voters approve of the measure on the November ballot that was proposed by the Governor and passed by the Legislature. When Governor Brown took office, the state faced a massive $26.6 billion budget deficit and estimated annual shortfalls of roughly $20 billion. These deficits, built up over a decade, have now been eliminated by a combination of budget cuts, temporary taxes approved by voters and the recovering economy. The budget includes $872 million of Cap-and-Trade auction proceeds – authorized by AB 32 – for greenhouse gas reduction, with an emphasis on assisting disadvantaged communities. The plan will modernize the state’s rail system, including high-speed rail and public transit, and encourage local communities to develop in a sustainable manner. It will also increase energy, water and agricultural efficiency, restore forests in both urban and rural settings and create incentives for improved recycling. The budget permanently allocates 60 percent of future auction proceeds to sustainable communities, public transit and high-speed rail. The remaining proceeds will be allocated in future budgets. Additional details on the 2014-15 budget, including line-item vetoes, can be found at www.ebudget.ca.gov. Chamber of Commerce buildRabbi, Cantor Jeff Schwimmer & Student Rabbi Rosenstein 10:00am followed by aSandy Kiddush lunch Membership dues are only $250 per person 951.679.0419 IncludesStudent High Holiday Seats Rabbi Sandy Rosenstein tbstemecula.org Learn about our religiousCantor servicesJeff andSchwimmer educational programs. Come meet us and have something to eat and drink. tile roofs need a closer inspection and again, a close-up look at the ceilings and attic. The electrical is equally important. Are there still plenty of spaces left in the main electrical panel or is it completely full with lots of “doubled-up” spaces? That could lead to breakers shutting off in the middle of summer, especially the HVAC (heat/air) breaker. A service panel like this needs to be replaced and the house electrical system properly upgraded so there are no safety issues to be concerned about. There are other issues that should be addressed as well. Are there cracks in the foundation that are visible? Is the sprinkler system working properly with no leaks and spraying away from the house at all heads? How about the windows, do they all work well? There are lots of considerations, both safety-wise and practical that should always be looked at when considering this kind of real estate investment. None of these corrections is complicated and all can be completed in a very short period of time. We’ve all heard the saying, “It takes a village to raise a child” at some point in our lives. It could easily be said, “It takes a community to build a business” wouldn’t you say? According to BusinessBrief.com, companies will lose 14% of their customers each year. To a small business, that may be the very thing that keeps owners up and night wondering where things went wrong. This fact has nothing to do with whether or not you added or removed employees, increased your services, or decided not to add a new item to the menu. The bottom-line here is, business owners must never stop prospecting. Guess where the most fertile ground is? In your very own backyard, your community. There are a few misconceptions regarding networking events and associations out there. Many business owners may believe that networking events full of “prospects” are the only ones worth attending, and joining an association will roll in new leads. Let’s address the latter first, shall we? Simply completing an application, adding the plaque to your wall and the logo to your website, are very small pieces of the puzzle. Associations do not work themselves. Being a member allows you the opportunity to meet and greet with others in your community while building strategic partnerships with fellow business owners. If you think paying the fee alone will give you a return on your investment, you are sadly mistaken. To dovetail off that, networking events are often full of other business owners like yourself looking for leads. More often than not, companies like yourself will outnumber the prospects. However, there is no reason to fret. Utilize the opportunities before you and team up with a complimentary business to yours. Let’s say, if I create websites and another prints brochures, we could make a great team. Together, we have increased our list of prospects. In closing, do not forget to prune the flowers in your own community. You never know what good things could blossom.